We didn't have much to do the next day, so we decided to take a walk down to Campuan, a village just on the edge of Ubud, to visit the Neka art museum. 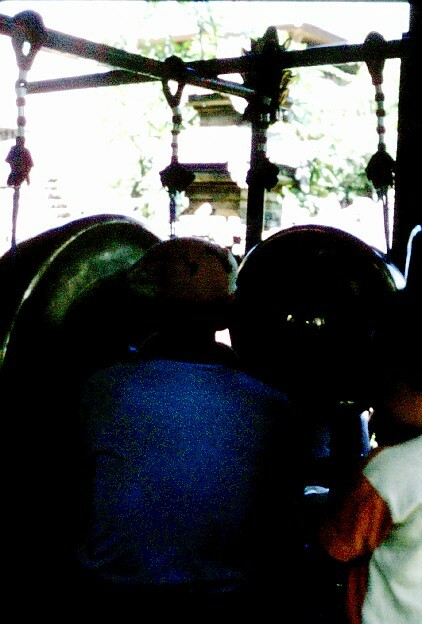 We made it as far as the Ubud Palace where we came across the gamelan practising. This was a gamelan gong, rehearsing in a bale just outside the palace. We watched as the reyong crew rehearsed. 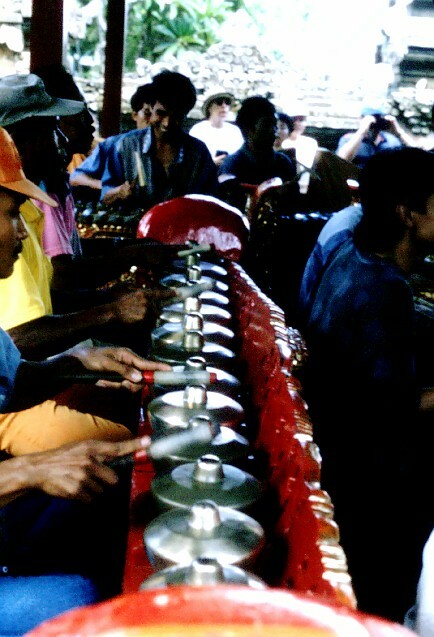 It was quite similar to our own gamelan rehearsals at home. The leader and drummer ran through sections of a piece while the players tried to get their parts right. Some of the players seemed quite uncertain of their parts, and were trying to learn quite long sections. You can see the large reyong with its many pots at left. The drummers are in the center. 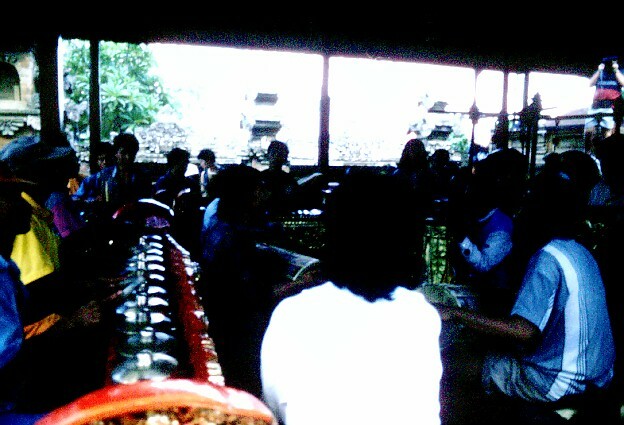 At the back you can see the poles of the gong stands. It was quite shady inside the bale compared with the bright sunshine outside, which made photography difficult. This old guy must have been playing gong all his life. He was surrounded by large gongs, and also played the small kempur gong with the handle of the gong mallet. A little boy was looking over his shoulder - his grandson? Maybe this was the new generation learning the gong patterns. It was hard to tear ourselves away, but eventually we did, and carried on walking down to the Campuan bridge and up some steps to "hilltop Campuan". This seems to be a place favored by long-term visitors. 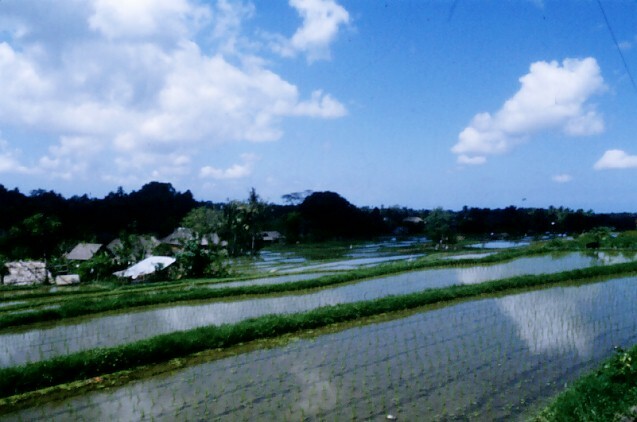 Beautiful rice fields all around, and nice places to stay. But we didn't stop for long - we were on a mission to find the Neka art museum. The signpost said it was "+/- 1km". Well it turned out to be more "+" than "-"! A long walk along the main road. It was a lovely museum though, with different pavilions devoted to various artists and styles - traditional Balinese painting, I Gusti Lempad, Ari Smit, the Europeans, etc. 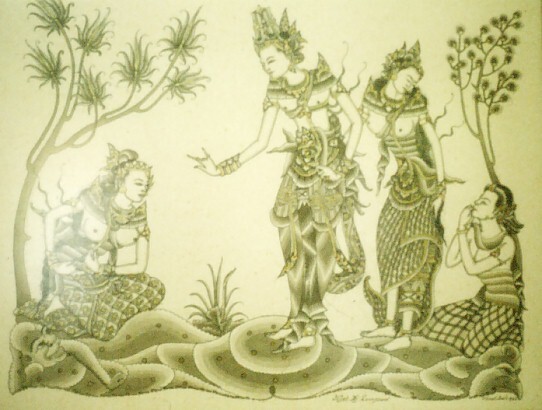 This is a painting by the legendary I Gusti Lempad - quite a renaissance man, skilled in art, architecture, and other forms of the arts, who continued to be creatively productive until his death in 1978 at the age of 116. Click on the image for a better look. 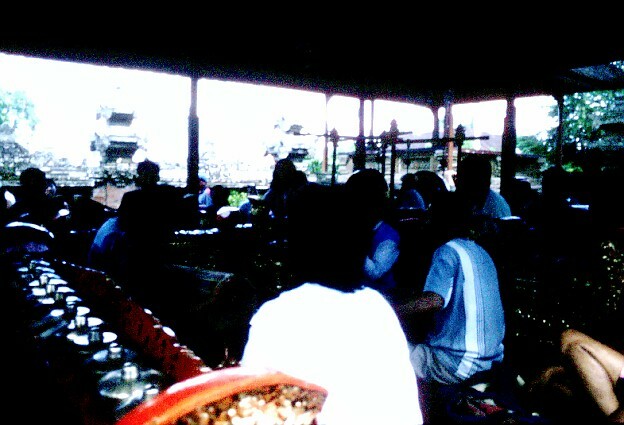 We managed to get a ride back to Ubud from the museum for our own gamelan practice at Linda's. We worked on our new piece with Sedana all afternoon. It felt like being in paradise.